Let’s accept it. Pizza lovers are everywhere. Almost everyone―young, young professionals, professionals, middle age, and senior citizen―got a grip of what pizza tastes like and had already their favorite flavor, crust, size, and brand of pizza. While reading this, maybe you also had in your imagination your personal favorite pizza, right? Of the many varieties of pizza around the world, one might be looking for something unique or novel to the eyes, while another might be looking for similar pizza or a little variation of their favorite pizza. Some might also want to explore and search for a new look and taste of pizza. Aside from consumers, sellers also are interested in finding novel ideas about pizza. These ideas are what they will be presenting in their menu designs. 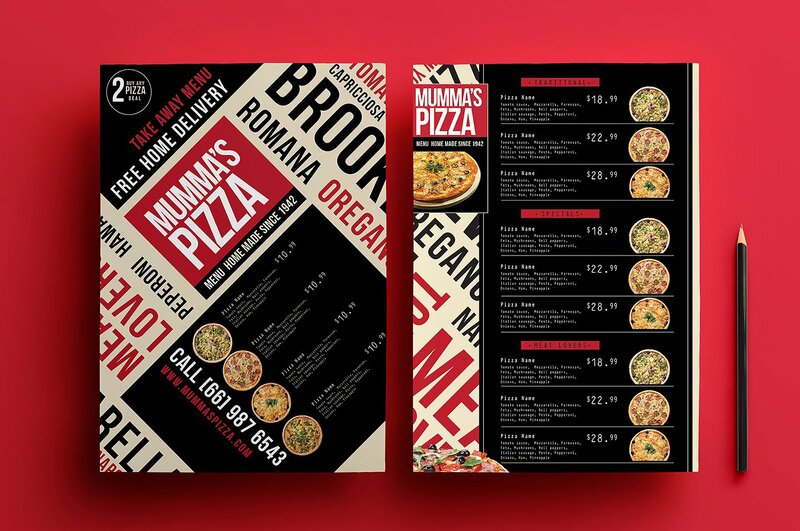 Whoever you are, a consumer or a seller, whatever taste you may be looking for, we are presenting these pizza menu samples to help you in your cravings for pizza or a desire for a pizza menu design. 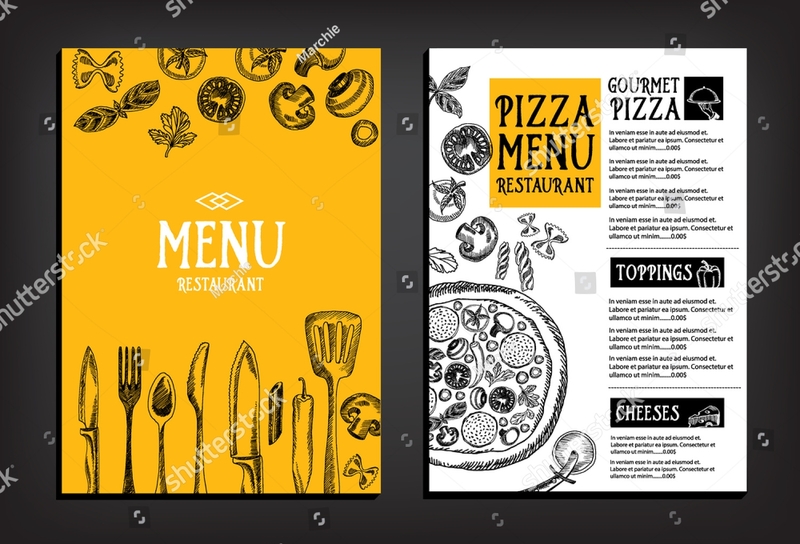 This type of pizza menu is presented through the use of brochure, hence, brochure-type menu. Brochures are materials that contain information or advertisement that are to be disseminated to people. They are usually bi-folded or tri-folded. If you are considering to make this type of menu, know that this has several advantages and disadvantages. Easy to distribute. 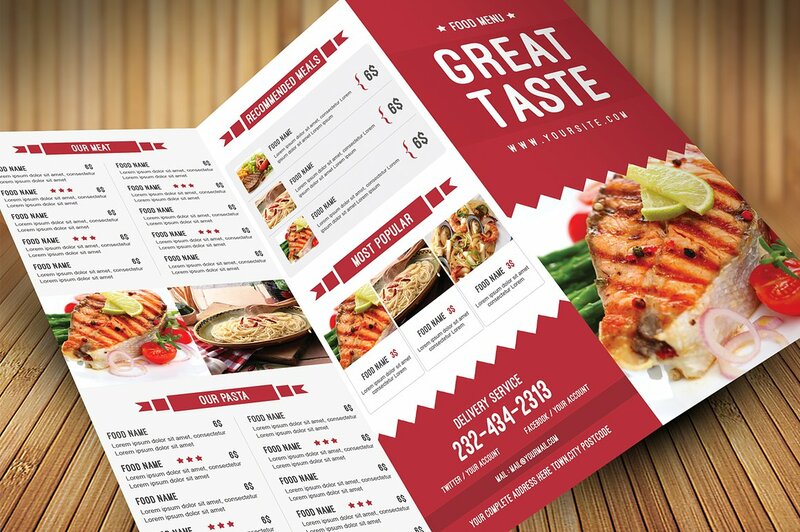 Because the size of a brochure is usually small enough to carry and to hand on to a reader, the distribution for your menu can be quickly conveyed to your customers. Cost-effective. Brochures are usually small in size, so there is lesser cost in printing of this material. You can spend a little money while already reaching many people. Easy to read. Mostly, brochures have only a little space; thus, the information must be concise and direct. In this way, people’s attention can be easily captured. Additionally, because the information is concise, the attention of the people can be undivided and can be easily focused in your menu. Limited space. Again, brochures have a limited space. Hence, you cannot add more euphistic words to your menu, only the very important ones. You must showcase your menu in that very limited space. Easily lost. Because brochures are handy, there is also a huge possibility that it can be easily lost. One might also forget where he placed the brochure that he just received. It can also be thrown anywhere which may lead to another disadvantage—environmental concern. Environmental concern. You might say that you are using a biodegradable material like paper. Still, this paper, when not properly thrown and especially when in bulk, can make a mess everywhere. Also remember that these papers are produced from trees. It is a common knowledge to everyone that our trees are slowly getting small in number, and we are already aware of the worst-case scenarios that might happen if our trees will continue to deplete. 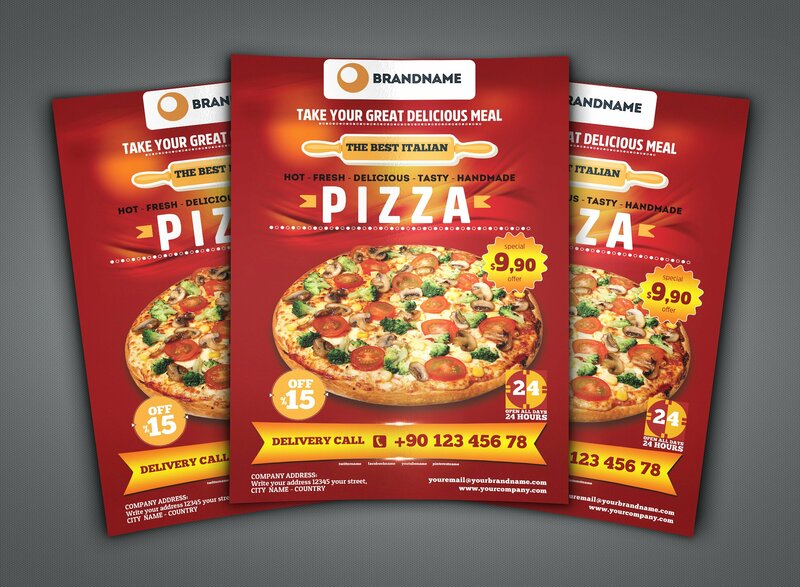 In this type, flyers are used to advertise your pizza menu. Flyers are usually one small piece of paper that are used for marketing and promoting products or services or for informative purposes. While a flyer can be advantageous, it has also disadvantages. The advantages and disadvantages of flyers are very similar to those of brochures. You might also want to create your own restaurant menu for your pizza. One thing you must consider is the appeal of your menu and how can you make your menu be alluring to the customers. Restaurant pizza menu is common in restaurants, of course, and it provides a complete list of the food that the restaurant is offering. 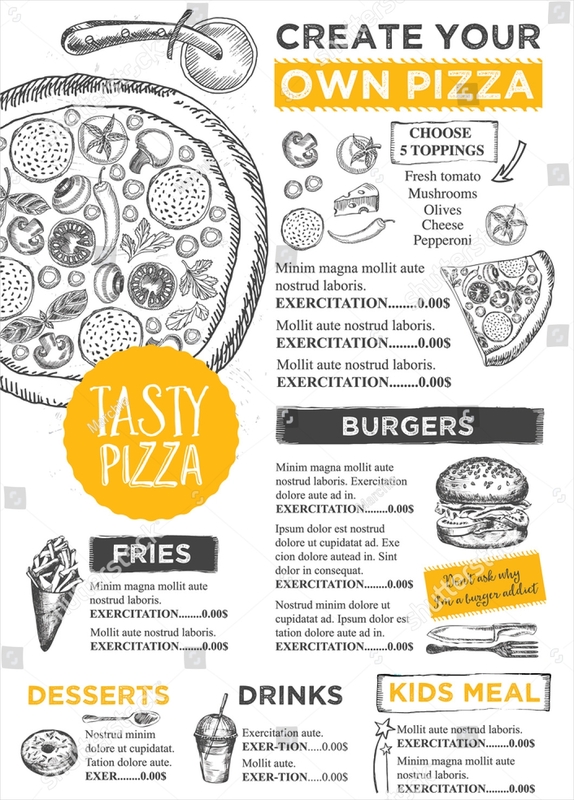 Take a look at these images for references to your restaurant pizza menu. Notice how the colors blend in together and how the design perfectly fit the food that they are offering. A little creativity might do the trick! A little tip: experts say red and yellow subconsciously trigger your hunger and appetite to eat! 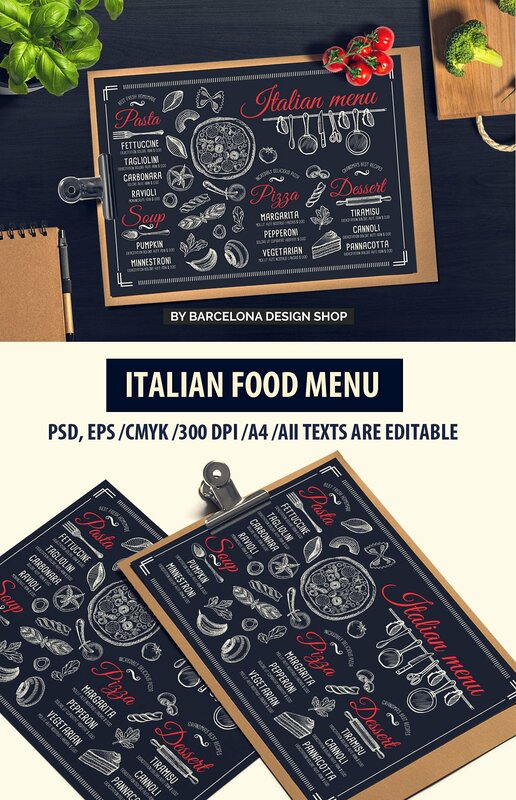 Remember that the essential part of a menu is of course the food but don’t underestimate the power of typographic tools—the art of styling and arranging your menu in a creative way to make it more enticing to customers. Chalkboard framed pizza menu is a menu that is being drawn or written in a chalkboard-like material. A chalk pen is used to write on the surface. Chalk pens are way better that chalks because it can last for a longer period of time than a chalk and it can’t be easily smudged. However, others might just choose a chalk-like font and print it than the traditional chalk calligraphy. These classic menus are the ones that are traditionally seen in pizza hubs and cafes. The designs are traditional yet presenting elegant and classy eye-catching menu. They presented the usual designs that are common to most pizza places. 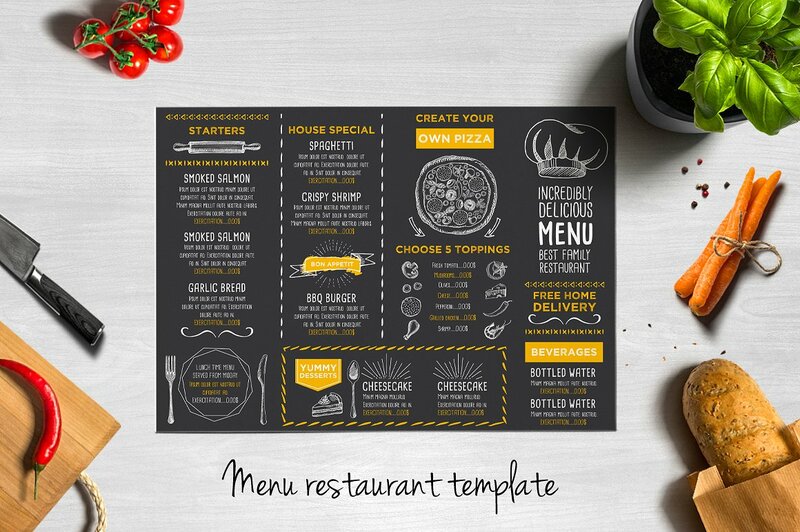 Although they are common, they are still informative ones and they are the ones that customers are already accustomed of and can easily get used to the design and presentation of the menu. 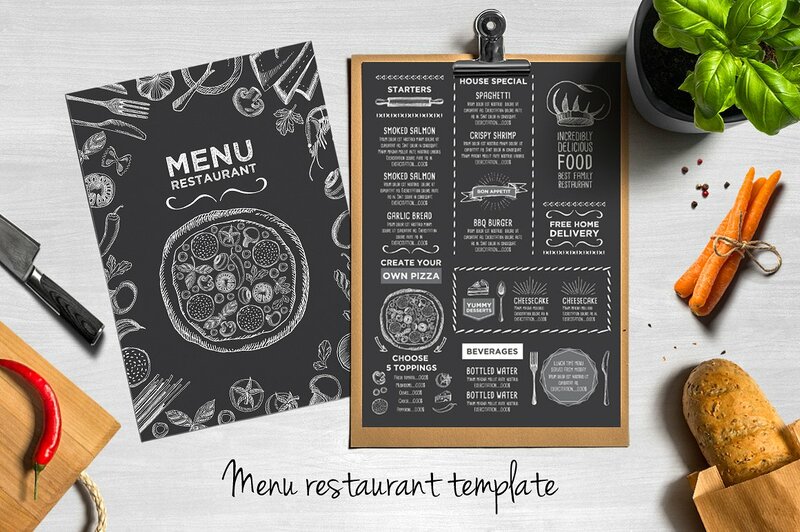 The menu is not that complicated or complex; it has a design enough to entice a customer. It is a reflection of your restaurant or cafe or hub. What you write on your menu is what you are offering. Always remember that. You are showcasing everything that you can offer through your menu. 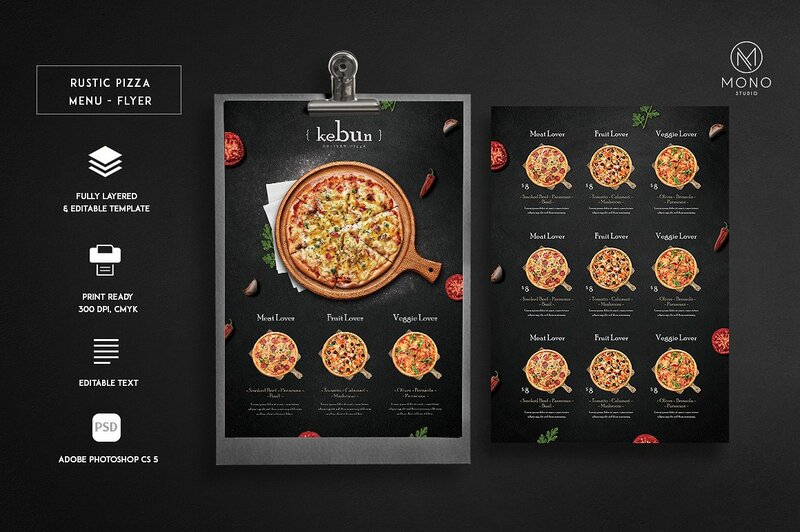 Surely, for a pizza menu, you want to see different flavors of pizzas, right? Who would want a menu that has only two or three flavors of pizza? So basically, you will hoard different flavors of pizza for your business and proudly showcase them to the people through a menu. Hence, your menu is what defines your restaurant or cafe or hub and how much you can offer. You must be proud of the items listed on your menu. It provides simple and direct information for the customers. A menu also serves as a guideline to the customers. It provides details like the size of pizza, number of slices, good for how many people, freebies and promos that can be availed of, and of course, the price. Everything about your pizza must be transparent in your menu. Usually, people prefer to look at the menu instead of asking things to the person assisting them in their orders. So, make sure your menu provides complete details; otherwise, the customers would be frantic and go around asking for important things that you might have forgotten to place in to your menu. It allures people. This is when you have to twist your creativity. You must be aware of the presentation of your menu. Bear in mind that this can invite people’s appetite to try your food. A good picture of the food can trigger their curiosity, while a bad one can lose their appetite or worse, customers would be discouraged to order at all. Also, make sure that your text is readable enough for the buyers. Make it clear, simple, and attractive. Lastly, don’t forget to include mouthwatering images of your pizza! If you will adhere to the suggestions above, it is impossible that your menu can’t capture people’s eyes and taste buds. The samples are good enough for your business, but you can also try to explore your creativity in making a new one. Just be optimistic about it, and trust in your confidence to design your own menu. Believe that everybody has an artist heart lying beneath the depths of their souls, waiting to be awaken anytime, especially through motivation.